South of the Indian peninsula, the eastern Coromandel coast along the Bay of Bengal has retained the beauty and purity of the ancient Dravidian culture which has been hardly touched by the Aryan invasions of the North. 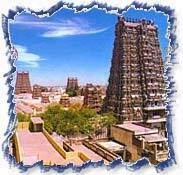 Temples of Tamil Nadu were the fulcrum of society. The art forms that have their origin in religious worship, continue to colour daily life. The Malabar coast along the Arabian Sea is a tropical paradise of undulating palms and sandy beaches, hill resorts, spectacular temples, backwater cruises and friendly people. Arrive Chennai, the fourth largest city in India, located on the warm shores of the Bay of Bengal. Modern Chennai traces its origins to 1639 AD, when the British East India Company was first awarded a trading post and commenced building Fort St. George, near the sleepy fishing village of Madras Patnam. The rest of your day is at leisure to relax. Tour Chennai, featuring historic as well as contemporary places of interest, such as Victoria Art Gallery, Bronze Gallery and Madras Museum. Continue your drive though Egmore to George Town stopping at Fort St. George, housing the State Parliament. Located within the ramparts of the fort is St. Mary's Church, the oldest Anglican church in Asia, consecrated in 1680 AD. The fort museum features relics of the raj. Drive along Marina Beach, visiting San Thome Cathedral. Your final stop is colour Kapaleeswarar Temple, devoted to Lord Shiva, where you have an opportunity to mingle with the devotees and observe the various rituals of Hinduism. 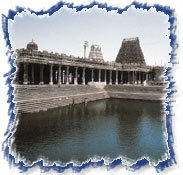 Full day Excursion to Kanchipuram and Mahabalipuram. Kanchipuram (58 kms), one of the seven secred cities of India, served as a capital for several dynasties, most prominent among them being the Pallavas and the Cholas, responsible for making the most spectacular temple city of India. Visit three of the best temples - Kailasanatha & Ekambareshwara, dedicated to Lord Shiva, and Vaikuntaperumal dedicated to lord Vishnu. Kanchipuramis also renowned for its silk, a traditional cottage industry art that has been handed down over the centuries from one generation to the next. Continue on to the ancient Pallavan port of Mamallapuram. Later visit the seventh century rock hewn monuments. The shore temple, the only surviving one of seven, is a unique example of a temple built of rock quarried elsewhere and carried to shore. After a morning at leisure a short flight brings you to Tiruchirapalli, better known as Trichy. Trichy has a long and checkered history predating Christianity. Several dynasties including the Cholas, Pallavas and the Pandyas reigned over this city in the agriculturally rich basin of the Cauvery river, also known for their patronage of art and architecture, who eventually ruled over Trichy during the 16th century, are responsible for most of what is left standing today. Visit the Srirangam temple complex today. Located on an island in the Cauvery River, it is among the largest in India, covering an area of over 600 acres. The temple is surrounded by seven concentric walls and has twenty-one gopurams or temple towers, one of which is covered in gold. Sri Jambukeshwara Temple, located across from Srirangam, is dedicated to Lord Shiva and has five concentric walls and seven gopurams, Rock Fort Temple. The views from the summit are spectacular. The afternoon is at your leisure. Drive to Tanjore (55 kms/1 hr) the ancient capital of the Chola kings, whose patronage and philanthropy rendered Tanjore a veritable haven for artists, musician and craftsmen. The dome on the apex of the central tower, 206 feet tall, is a single piece of granite weighing an estimated 81 tons, which was put in place using a ramp 3miles long, similar to the technique used in building the pyramids of Egypt. Later drive to Madurai. which is 170kms/4 hrs. Madurai is a bustling city packed with pilgrims, buisnessmen, bullock carts and legions of rickshaw wallahs. It is southern India's oldest center of pilgrimage and learning. Visit Shree Meenakashi temple, a riotously baroque example of dravidian architecture. Tirumalai Nayak Palace, build in 1636 in Indi-Saracenic style, and the Gandhi Museam, containing memorabilia of the father of the nation. Continue to Mariamman Teppakkulam Tank. Built in 1646, the tank is fed by underground channels from the Varigai River. Your exploration of South India continues as your drive to Thekkady (140 kms/31/2 hrs) located on the Tamil Nadu / Kerala border. This unique wildlife sanctuary is about 300 square miles and centered around an artificial lake fed by the Periyar river. Game viewing this afternoon is onboard boats, which carry you along convoluted waterways and afford sightings of elephant, bison, deer and occasionally, tiger. All manner of flora and fauna flourish in this tropical habitat, making it one of the premiere reserves of southern India. Venture on a game viewing boat cruise this morning, before continuing on to Kumarakom. 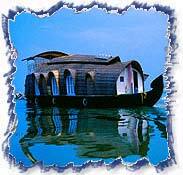 The state of Kerala, is known for its numerous canals and waterways. Kumarakom (114 kms/3hrs) is a tiny settlement, nestled in the backwaters of Kerala and evokes images of Kasmir, This part of Kerala offers a variety of therapeutic massages, which are both relaxing and healing and are indigenous to this region. Take a boat ride on the Vembanand Lake to the Kumarakom bird sanctuary. A part of the forest was submerged in the lake, offering an irresistible habitat to both migratory as well as local birds. Waterfowl, cormorants, egrets and teals are seen in abundance. The afternoon is at leisure. Those interested in Fishing can take advantage of the rich waters or a relaxing massage is also a tempting option. Drive to Trivandrum (170 kms / 4 hrs), Kerala's capital city and principal seaport. Known as the "city of the sacred snake". Thrivandrum is a city built over seven luxuriously forested hills. A low skyline and red tiled roofs lend a distinct character and ambiance to this most unusual capital city. Check into your beach hotel. Morning at leisure. Later fly to onward destination with your international flight. (hotel checkout at 12:00 hrs).